I am elated to announce that I’ll be offering custom 1-day Personal Immersions to individuals looking for a deep creative reset this winter. Winter is a precious & potent time to go inward and reflect on our priorities and life design systems. I would be honored to guide this rich creative process with you. I've been practicing this process with my partner, Carson, for the past several years all around the world with profound results (learn more about our work and process here). We have also begun prototyping this format with other independent creatives and entrepreneurs over the last 3 months and discovered deep resonance and effectiveness. We're now opening the offering to our community at large in hopes of greater impact and service. and beheld in reverant reflection & love. Personal Immersions are intimate, day-long 'life design sprints' to bring you deeper into integrity, purpose and creative freedom. This is an opportunity to create the time & space to look honestly at the patterns and habits in your whole life & work. Whether you are undergoing a major life transition, launching a new business, or feeling creatively or energetically stuck, the power of immersion allows us to suspend our current reality and see ourselves in a greater context, reconnecting us to our highest purpose and potential. We'll work on balancing our masculine and feminine sides of ourselves. From the feminine, when we truly allow truth to speak, honoring it with our loving attention, we begin to say yes to experiencing love, witnessing our innate beauty, and becoming open to change. From this fertile space, we can powerfully re-align our deepest truth with how we live and our daily rituals. Opportunities will flow in freely and dots will connect when we see & act from our truth and deeper knowing. From the masculine, I'll help inventory your time, projects and workflows to get real about where your energy is going. I'll also share everything I've learned as a nomadic creative, including my favorite tools, systems and rituals to bring consistent harmony to my life and work. These rituals of reflection and check-ins have become a weekly, monthly and annual ritual for me, becoming annual reviews and commitments that serve as milestones for your life (you can see my 2016 annual review here). We've led immersions for companies and teams around the world, helping them rebrand and overcome creative blocks for the past 8 years (see our studio, Metapattern, to learn more about our work and process). The personal immersion is a condensed version of our unique process, applying human-centered design thinking to our own lives. We see our lives as art that deserves the attention and love that we pour into other aspects of our lives. 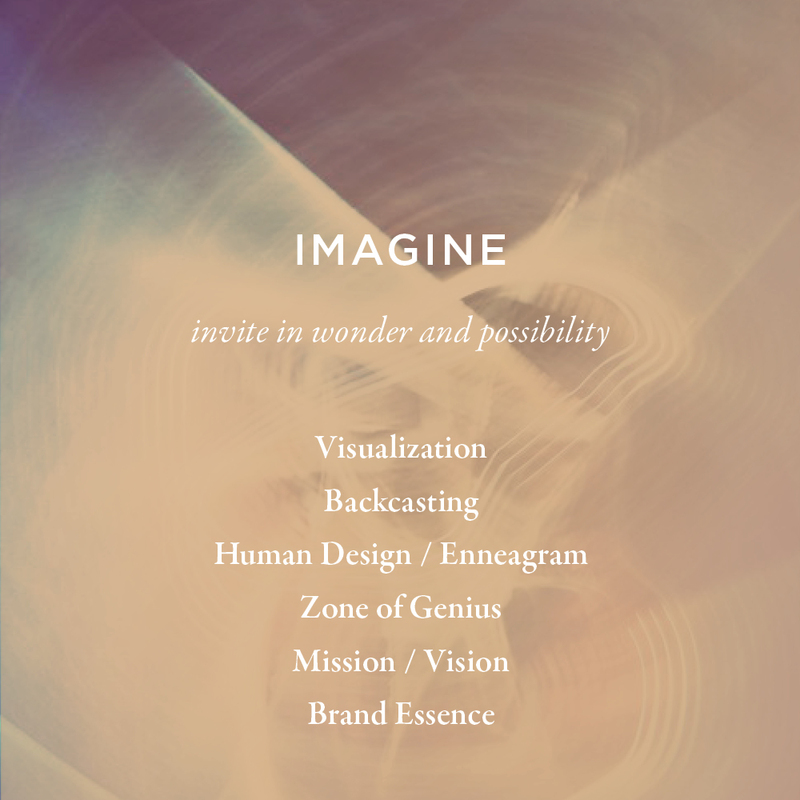 We’ll co-design an immersion experience that fits your needs and intentions, focusing on particular areas of challenge or inquiry. Never forget: You have so much to give this world. You were born with a unique signature; only you hold the key to unlock your well of wisdom and innate Self. It would be an honor to reflect you and help bring your creative genius into the world. The world needs you. Tailor made day-long experience to meet your needs and intentions at my beautiful home studio. I will take care of all facilitation, consulting, design, scribing and logistics. 1-hour prep call and consultation. Pre-reading and mapping ahead of time to architect experience. 3 home-cooked, healthy meals will be served (according to your dietary needs). Tea, coffee & homemade treats throughout the day. In our 1-hour prep call, we'd enter a discovery process around your intentions for our time together and identity any specific area you'd like to focus on. You'll be able to choose from a palette of exercises from the cards below. Before our immersion together, you would fill out a questionnaire and send along any informative links and projects so I am fully briefed before we meet. After getting settled and cozy with hot tea and a warming breakfast, we'd open our session in the zendo to open our mind & body to reflect on the past. We'll take short movement breaks for somatic releases of any underlying tension, and then enjoy a nourishing lunch on the patio before we enter our creative exploration. Working with our modular creative space, we'll enter into design mode - using analog cards to digital moodboarding, and celebrate over a delicious dinner. Over tea and dessert, we'll integrate our learnings into tactical plans and timelines to send you off with creative confidence. I'll package all our notes, photography and artifacts generated into a synthesized email, plus additional resources, links and recommendations. I will be available for a check-in call if you have follow up questions, and would be happy to continue our collaboration on a project-basis. I have space for six (6) beautiful humans to work with this Spring. First come, first serve. Please inquire using the form below. Ready to get integrated? Share your info below and we'll call you to get started.